These Angus producers were elected to serve on the Ohio Angus Association Board of Directors and are pictured at the 2019 Ohio Angus Association Annual Meeting and Banquet recently in Wooster. Seated, from left, are Wesley Untied, Frazeysburg, director; Joseph Sanders, Harrod, chairman of the board; Allen Gahler, Graytown, treasurer; Todd Raines, Seaman, president; Keith Kauffman, Danville, vice president; and Daniel Wells, Frankfort, executive secretary. Directors standing, from left, are Scott Millikan, Napoleon; Chip Enos, Cambridge; John Hall, Cardington; John King, Tiffin; Fred Penick, Hebron; Ron Miller, Wapakoneta; David Baird, Washington C.H. ; Nick Wagner IV, Attica; Shawn Howell, Shelby; Tim Harsh, Radnor; John Grimes, Hillsboro; and David Felumlee, Newark. Alex Tolbert | American Angus Association. 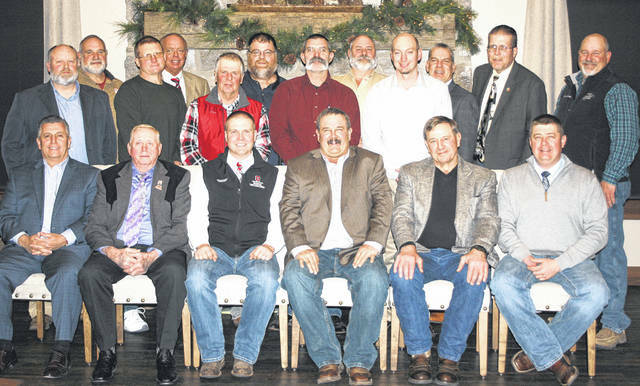 https://www.timesgazette.com/wp-content/uploads/sites/33/2019/04/web1_Angus-Board.jpgThese Angus producers were elected to serve on the Ohio Angus Association Board of Directors and are pictured at the 2019 Ohio Angus Association Annual Meeting and Banquet recently in Wooster. Seated, from left, are Wesley Untied, Frazeysburg, director; Joseph Sanders, Harrod, chairman of the board; Allen Gahler, Graytown, treasurer; Todd Raines, Seaman, president; Keith Kauffman, Danville, vice president; and Daniel Wells, Frankfort, executive secretary. Directors standing, from left, are Scott Millikan, Napoleon; Chip Enos, Cambridge; John Hall, Cardington; John King, Tiffin; Fred Penick, Hebron; Ron Miller, Wapakoneta; David Baird, Washington C.H. ; Nick Wagner IV, Attica; Shawn Howell, Shelby; Tim Harsh, Radnor; John Grimes, Hillsboro; and David Felumlee, Newark. Alex Tolbert | American Angus Association.